For several years I worked in Bosnia and spent a lot of early Decembers in Sarajevo, a multicultural city that was still predominantly Muslim, before returning home for Christmas. The country was also in a post-war period and struggling to rebuild. I was always struck by the contrast between their society as it prepared for the winter solstice and year-end and mark varied religious celebrations and the onslaught I got when I came home the week before Christmas where I was bombarded with the pre-Christmas hype and commercialism that we endure in North America. In the past few years, retailers have developed special shopping days to encourage people to buy, buy, buy – Black Friday and Cyber Monday. The aim seems to be to offer bargains for people buying Christmas gifts and help the retailer get everyone in the spending mode. This year, for the first time, Canada will mark Giving Tuesday. Instead of focusing on getting, on December 3 there will be a country-wide effort to think about giving back – either through donations or volunteering. 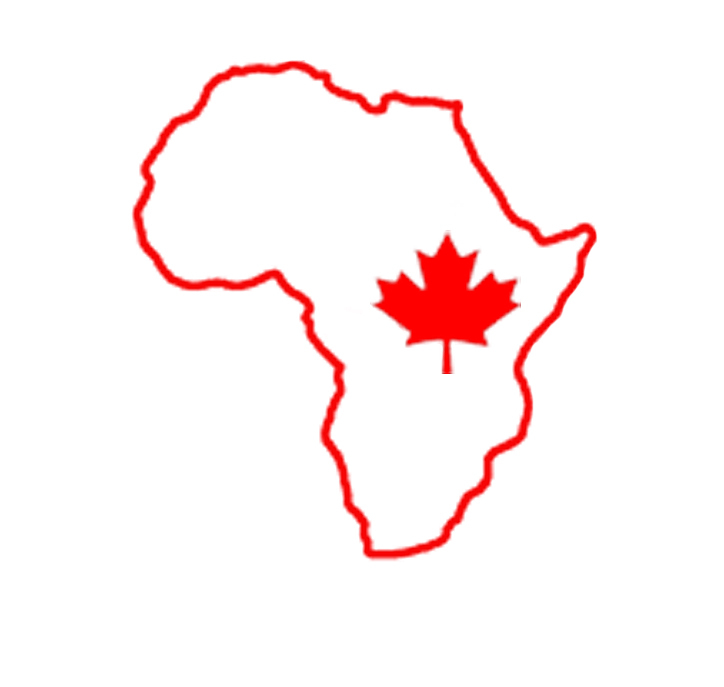 The CanAssist African Relief Trust depends on donations from people across Canada to do the infrastructure support work in East Africa that we know helps communities to improve their well-being. We fund school classrooms and desks, hospital equipment and beds, rainwater catchment equipment in schools, clinics and communities, latrines for vulnerable children and adults at schools and in villages where no facilities have existed. Each year CanAssist attempts to fund about $100,000 work. We rely on the generosity of donors to do this. This Giving Tuesday we hope you will consider the CanAssist African Relief Trust in your charitable activities. 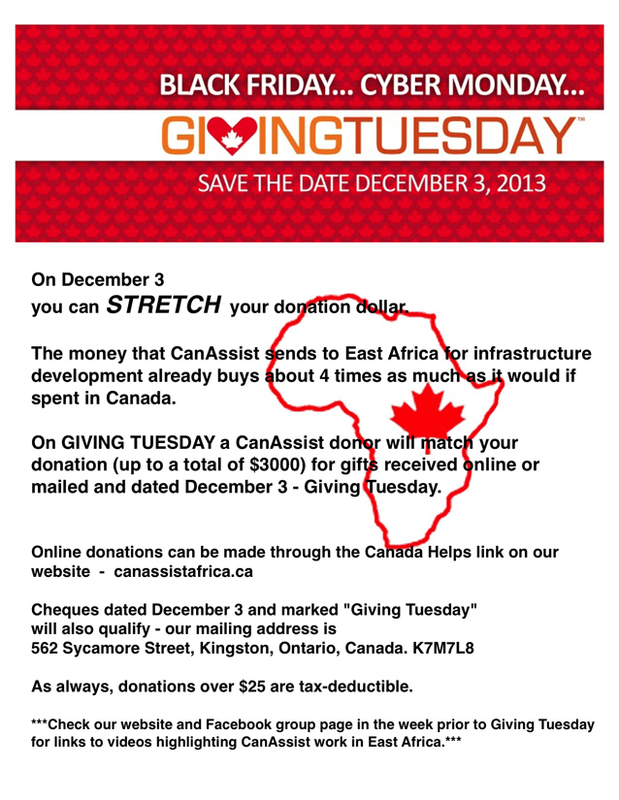 And a bonus is that a donor has agreed to match the first $3000 in donations to CanAssist on December 3. So the value your donations (which already can buy about 4 times as much in East Africa as it would in Canada) will be doubled. Your donation will also be tax-deductible. A study in the U.S. last year showed that the majority of people would prefer to have money donated to a charity than receive a gift that they could not use or did not really want. In this Holiday Season, please put CanAssist on your Giving list. Donations can be made with a credit card on the Canada Helps link below or by searching for CanAssist on the Giving Tuesday website. Or you can mail a check to 582 Sycamore Street, Kingston, Canada K7M7L8. In the next few days, I will post some videos that highlight some of the work that CanAssist has already done in Kenya, Uganda and Tanzania. We plan to continue to do similar work next year with your support. Listen to members of various CanAssist partner communities as they express their appreciation for the generosity of Canadians that is making a difference for them and their families.